My grandmother, Hanna, collected quite a few chicken curry recipes, a surprisingly exotic departure from her preference for plain food. I don’t remember meeting anyone from India while I was growing up in Richmond, but Indian food was nonetheless popular in the American South. In the 18th and 19th centuries, Indian spices carried a high-class cachet because they had to be imported via England and the Caribbean, according to Curry: A Global History by Colleen Taylor Sen. The Virginia Housewife, first published in 1824, contains a recipe for chicken curry “after the East Indian manner” and Curry of Catfish. Country Captain chicken became a Southern sensation in the 19th century. In some stories, it was created by a British sea captain in the India trade who docked in either Charleston, South Carolina or Savannah, Georgia (or both). In others, the “captain” refers to an Indian native who worked for the British army and taught sailors the recipe. Country Captain recipes vary, too, but basically call for chicken simmered with tomatoes, onions and curry powder, then garnished with currants or raisins and almonds and served over rice. President Franklin D. Roosevelt became a devotee after tasting this dish at Warm Springs, Georgia in the 1920s. So did his guest, General George S. Patton, who also ordered it near Fort Benning, Georgia. This dish spread north to Delmonico’s restaurant in New York in the early 20th century. James Beard, legendary cookbook author in New York from the 1940s until his death in 1985, also made it. This recipe from the New York Times in 2009 shows its continued popularity outside of the South. 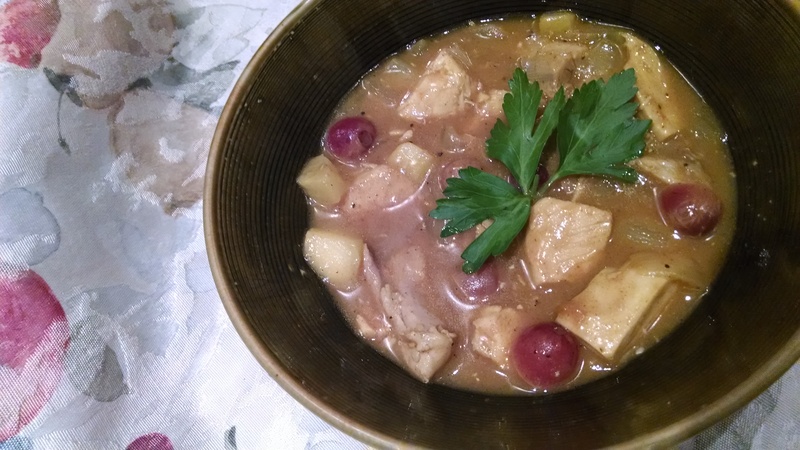 My grandmother’s recipe, though not Country Captain, seems to fit right into the tradition of curry in the South. Her version calls for fruit instead of vegetables but it does hark back to the pre-global marketplace days when curry was considered exotic. “Excellent,” she wrote on the recipe card with the date September, 1965, so she must have liked it. So did I. The combination of fruit and with fowl seems a bit out of favor right now, so I was glad to rediscover it. Heat 2 tablespoons of the butter in a large skillet over medium heat. Add the onion and saute until translucent. Sprinkle with curry powder and cinnamon and stir it in. Add the chicken and brown lightly. Scrape everything out of the skillet and set it aside in a bowl. Add the remaining 3 tablespoons of butter to the skillet and let it melt over medium heat. Stir in the flour and continue stirring until it is smooth, making a roux. Whisk in the chicken stock, continuing to whisk until the liquid is thickened and smooth. Add the apples, raisins, pineapple, and sugar. Simmer 15 minutes. Add the chicken and onions and heat through, about 5 minutes more. Serve with rice and garnish with grapes. 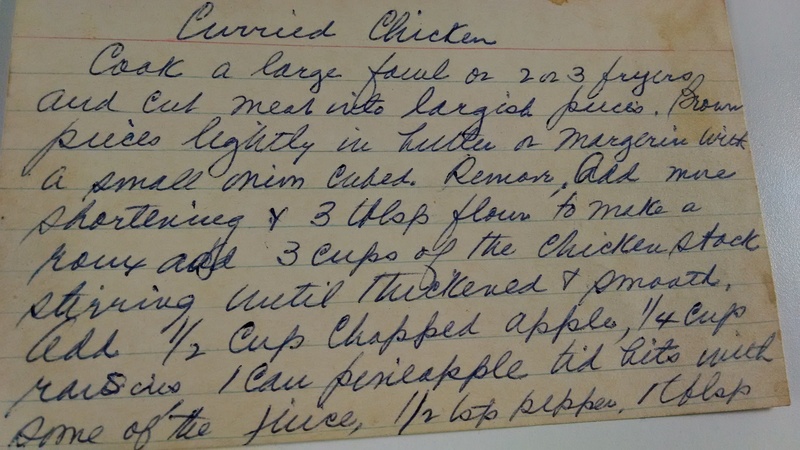 This entry was posted in Food and tagged chicken, country captain, curry, Franklin D. Roosevelt, Georgia, India, Richmond, South Carolina, The Virginia Housewife, Virginia. Bookmark the permalink. I love that she said fowl instead of chicken! What exactly is fowl? Is there a difference? Fowl applies to other birds, such as turkey or duck. But I think chicken would work best in this recipe. I remember Country Captain chicken from my childhood (the 1960s)! I agree that chicken and fruit doesn’t seem like a popular combination these days, but I miss this dish and will definitely try your recipe. Thanks for your comment! I hope you like the recipe. I’ve been enjoying your blog, too.